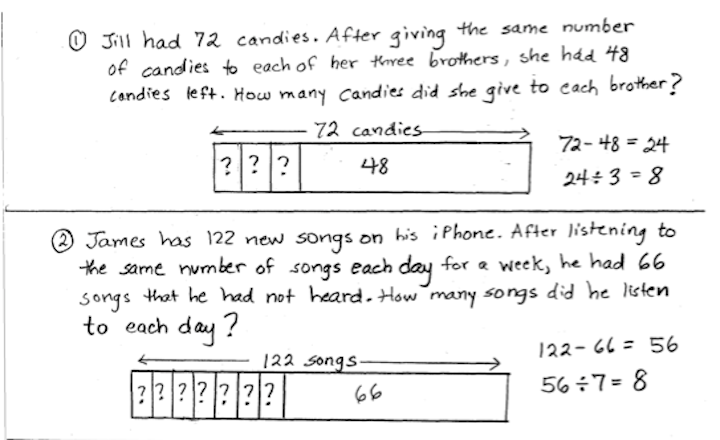 By grade 4, students have worked with all four operations and are expected to solve multi-step word problems. Research tells us that young children naturally attempt to model the actions and relationships in a problem, while older children appear to look for superficial clues – which operation has just been taught, key words, looking at the numbers in the problem – in order to know what operation to use. Jill had 72 candies. After giving the same number of candies to each of her three brothers, she had 48 candies left. How many candies did she give to each brother? About half of the students solved the problem correctly, and the other half showed thoughtful progress toward making sense of the problem. James has 122 new songs on his iPhone. After listening to the same number of songs each day for a week, he had 66 songs that he had not heard. How many songs did he listen to each day? This time, about 80% of the students solved the problem by multiplying 122 x 66. Looks like the research is on target; these two problems have exactly the same structure, but students who tried to make sense of the problem in the beginning of the year just used what they had recently learned – multiplying multi-digit numbers – and did not bother to think about the meaning of the scenario. So what can teachers do? I have found that modeling word problems is an amazing strategy to help students see similar structures in problems and help them return to that place when they were younger where they followed the actions and relationships in problems. I’ve been using the Singapore Model Method for years and am thrilled that these models have been incorporated into the Common Core State Standards, where they are known as tape diagrams. Here’s a comparison of the models for the two problems above.